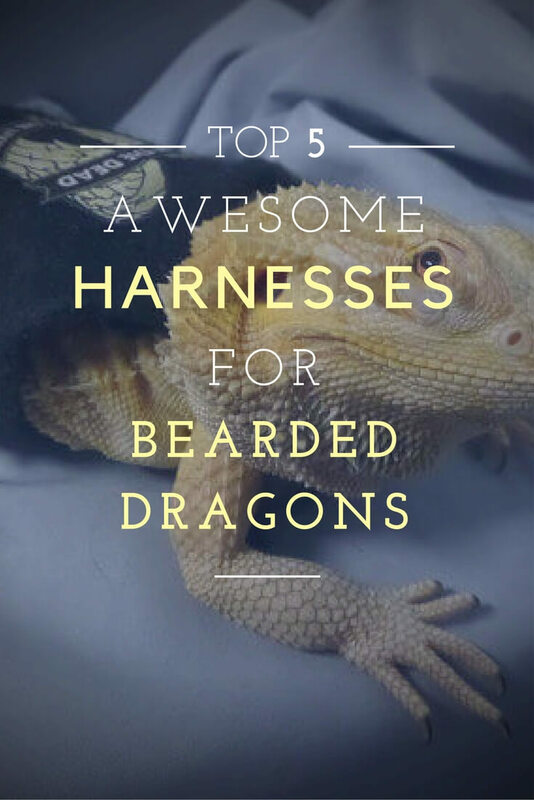 So below is a table with the 5 best bearded dragon harnesses (in my opinion and based on the customer reviews). If you want to see more images of one of the harnesses or more details to the product, simply click on the image. Bearded dragons are not only one of the best and most popular pet reptiles, they are also one of the calmest pet reptile you will find. Most dragons do not even need to be tamed down, they are already calm right from the start and don´t mind to be petted or handled. With such a calm and friendly reptile, you can do a lot of funny and cute stuff. At least that´s what I have seen on the internet recently. There are a lot of people who add the last and missing piece to their bearded dragon to make it a real dragon. 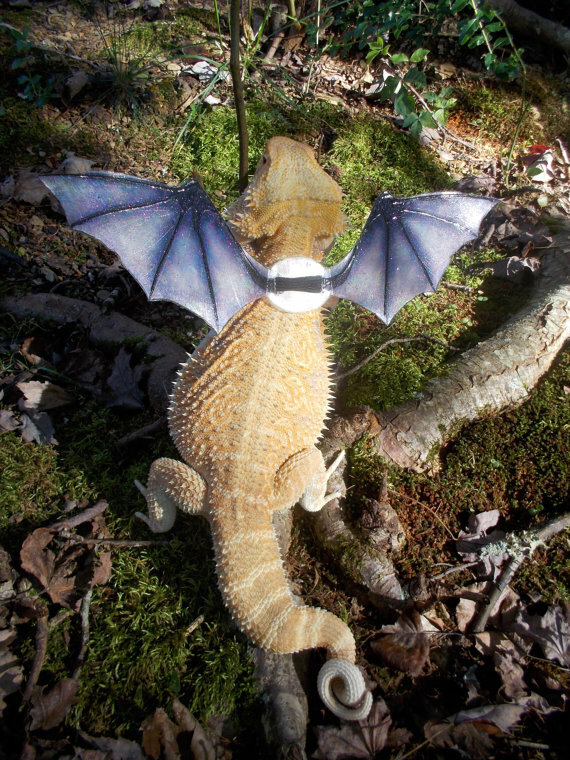 Yes, I am talking about some cool bearded dragon wings here guys. I mean how awesome is that? Especially in the time of Game Of Thrones, everyone wants to be Khaleesi and have some baby dragons for protection and cuddling. Heck, even I want to be Khaleesi and I am a man, lol. The first wings for bearded dragons I have seen were pretty bad to be honest. 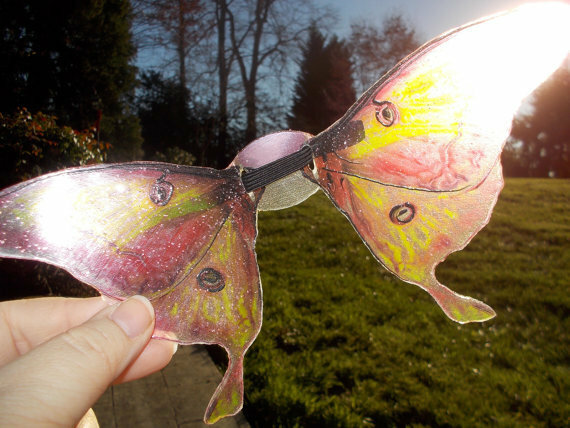 The wings did not look really good, it was just a piece of cloth hanging down. However after I have seen the first dragon wings I did my research guys… and what I found was awesome… to be honest it was more then awesome. 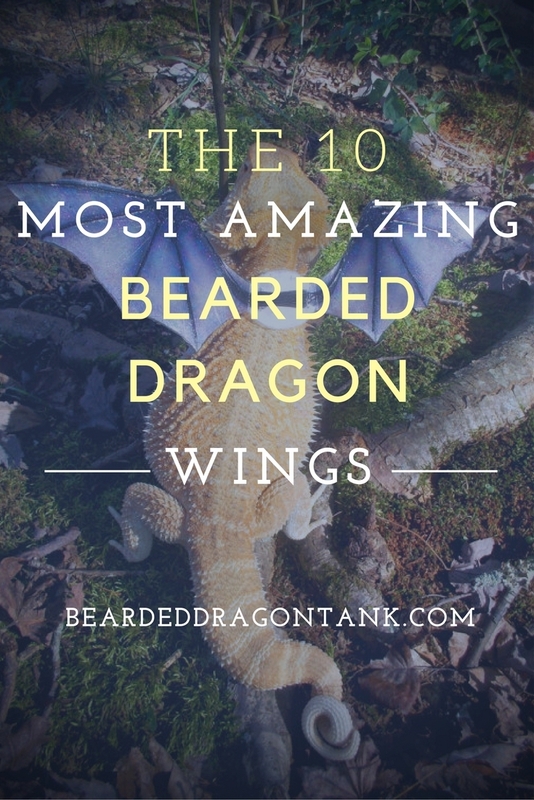 People really put some effort in creating epic looking wings these days and I have compiled the 10 best looking beardie wings for you in this article. 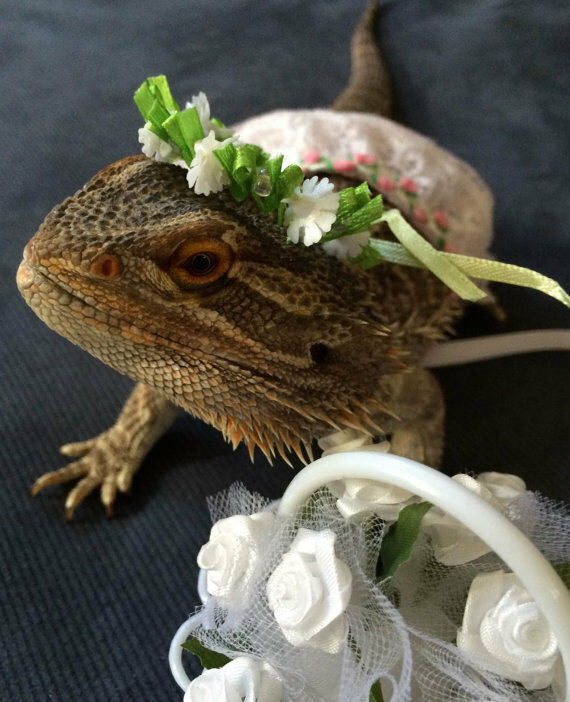 If you buy some bearded dragon wings, I totally understand that you probably freak out when you get them in the mail and most probably you also want to put them on your bearded dragon immediately, get your Khaleesi dress (no matter if you are a girl or a boy) and take some epic selfies with your little dragon. However please do not forget, even if bearded dragons are really, really calm, you should always let your bearded dragon get used to new stuff. 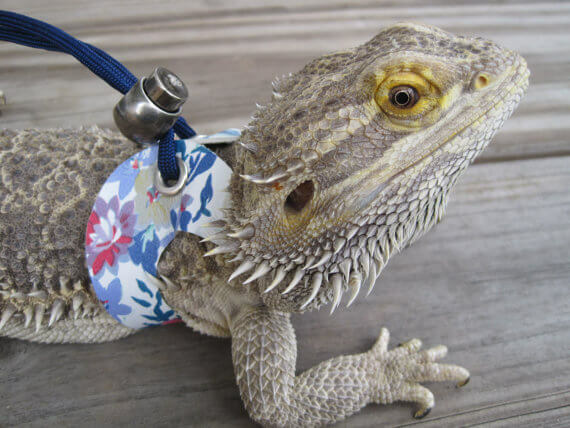 If you buy something like wings, leashes or harnesses for your bearded dragon you should always keep in mind that having something on their back or around their neck is a completely new experience for your beardie. Even if your dragon is totally calm it can happen that your dragon freaks out. When I get something new like a leash or wings I place it near the terrarium so that my bearded dragon can get used to its presence over time. After a couple of days your beardie is completely used to that new weird object and that will make it easier to put on the wings. You can even place the object inside you bearded dragon tank if you have enough space for that. 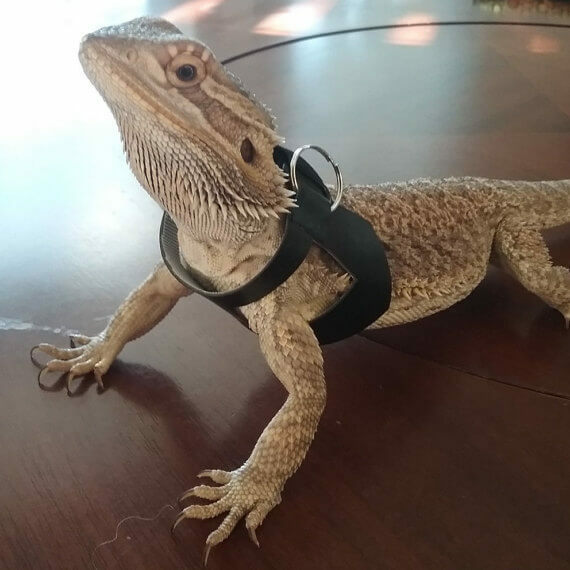 Even if you have a bearded dragon that does not like leashes, costumes or wings, that might help. Alright guys, here it is. I compiled the coolest looking wings for your dragon I could find. 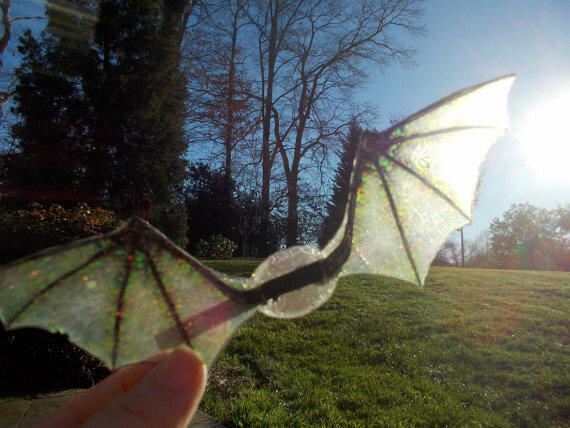 However there are also a lot of other wings on Etsy. If you do not find anything below, which I highly doubt, head over to Etsy and check out what those amazingly creative people offer there. I Just want to let you know, all wings very made in the U.S. and can be purchased there. However even if you live in another country, you can always ask the vendor if they ship to your country. In most cases they even tell you in the description where they ship to and that if you have any problems or questions, you can contact them. I live in Germany and ordered like 4 wings for my bearded dragon and it was no problem. Feature: Glow In The Dark! Alright guys, here it is. I compiled the coolest looking wings for your dragon I could find. 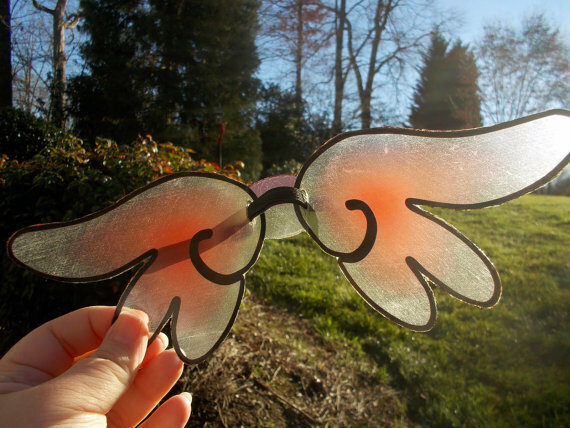 However there are also a lot of other wings different colors on Etsy. If you do not find anything below, which I highly doubt, head over to Etsy and check out what those amazingly creative people offer there. Which wings do you like the most? Did you purchase some wings? 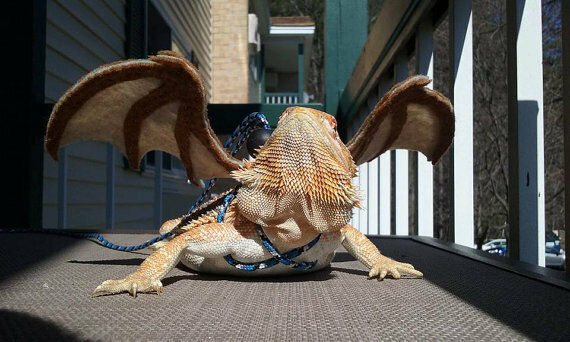 What do you think about a bearded dragon with wings? Do you also feel like you are the Mother Of Dragons no matter if you are a man or a woman? 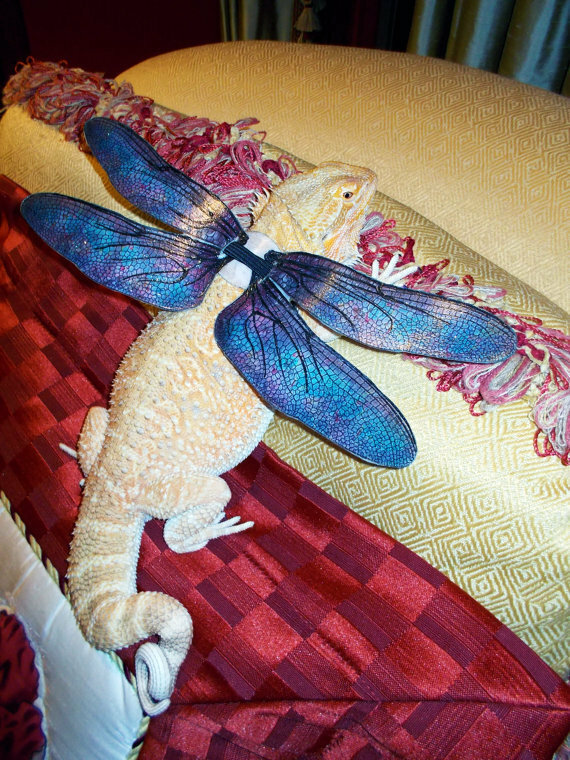 Did you have any problems putting your bearded dragon those wings on? Tell me about it in the comment section below,. I am excited to hear your stories and chat with you. A lot of people who want to own a reptile decide to go with a bearded dragon and let´s face it … bearded dragon owners (me included) are a little bit different from normal people. Most of us love dinosaurs, dragons and weird creatures in general and I guess that´s why we got a bearded dragon, right? Further a lot of us are geeky (me included). Star Wars or Star Trek is our religion, we love series, we watch Game Of Thrones, Sons Of Anarchy and The Walking Dead all night. What happens when geeks like us decide that our very dangerous, huge dragons should be a little more like us? Right! 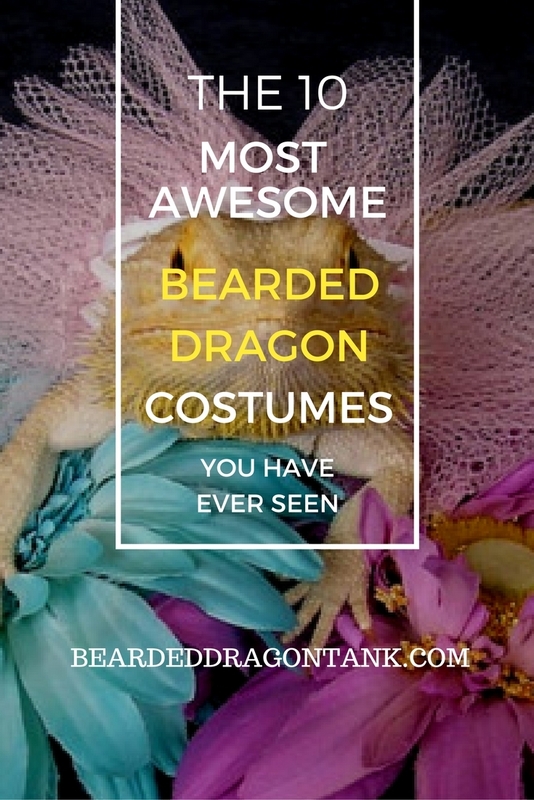 We decide to create some really cool bearded dragon costumes! To be honest, I think 3 weeks ago I did not even know that stuff like bearded dragon costumes exist. Here in Germany nobody would buy those costumes for their bearded dragons, since everybody here tends to only observe their bearded dragon and handle them as little as possible. Fortunately in the U.S. people like to handle their bearded dragons more often. They cuddle and play with them, which is absolutely great and of course, that´s also great because otherwise nobody would create those awesome costumes for bearded dragons. Okay enough about geeky stuff and german culture. 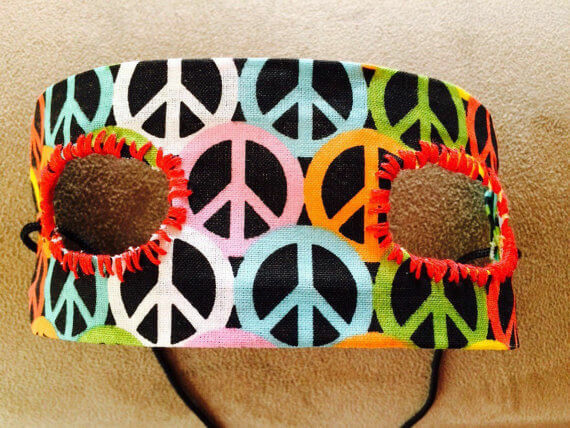 I bet you only want to see those extremely creative and gorgeous customes and you want to know where to get them. 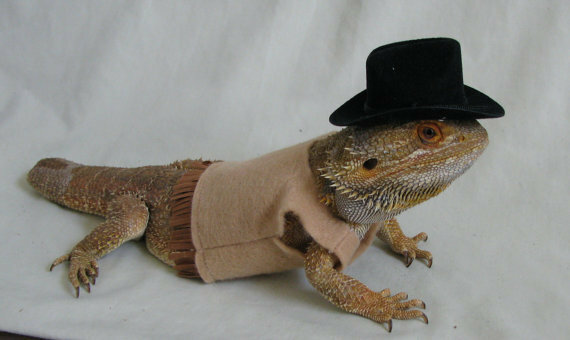 Don´t worry I did my research for you …and while I did my research I think I bought 6 bearded dragon outfits, lol. All of the bearded dragon clothes below are handmade and from the U.S. but fortunately they ship to a lot of other countries. Otherwise I would not have been able to buy them. 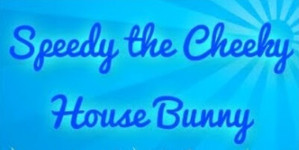 Click on the image to see more pictures of the costumes you like. There are a lot of trash movies where sharks are the dangerous creatures that terrify some teenagers. You can see sharks in a supermarket, sharks in tornados, two headed sharks, but have you ever seen a dragon shark? No? Well, here it is and I bet it is almost killing you with cuteness! Absolutely amazing costume. Bearded dragons are not elegant? Those days have passed. 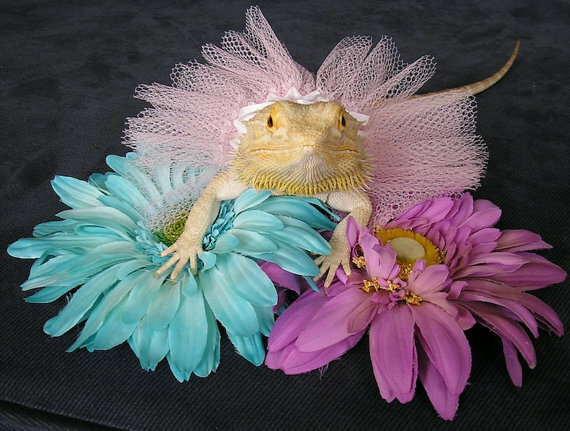 For everyone who owns a bearded dragon with a secret passion for ballet, here comes the dragon tutu. 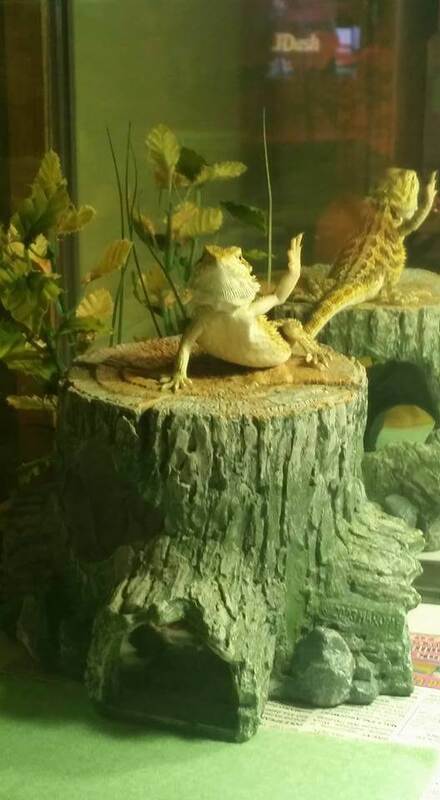 …If your bearded dragon really has a passion for ballet please email me… no, seriously the world needs to know that. Did your bearded dragon just graduate from college? No problem! 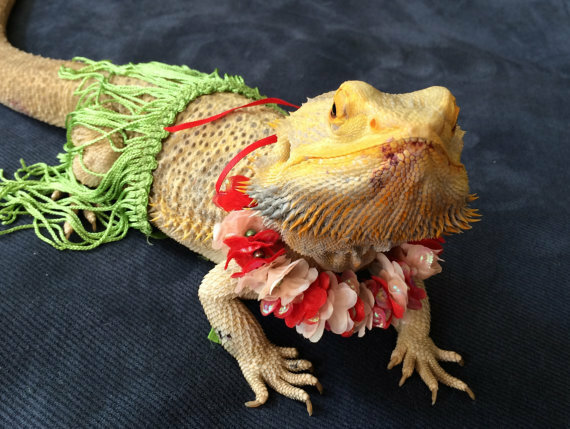 With this costume your bearded dragon is ready for the big day …. hmmmm, they grow up so fast, don´t they? Yes, it is a cowboy dress. No, it does not come with a little gun, BUT the vest comes with a little sheriff´s star. 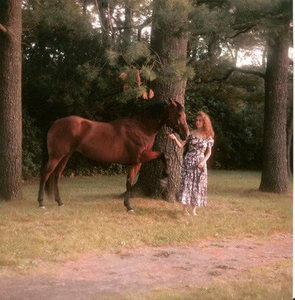 Just click on the image to see the other pictures. There you can see the star. Ah and the vest is probably bullet proof… just saying. 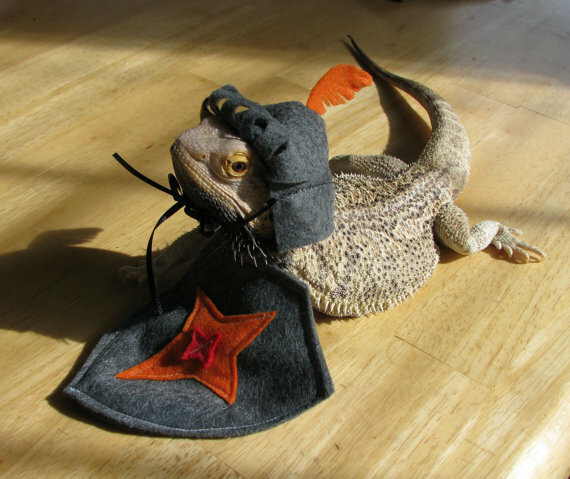 A bearded dragon dressep up as a knight is ready to defend your home, which is your castle and ready to kill evil dragons…. Wait, what? Star Wars fans get your hands up! 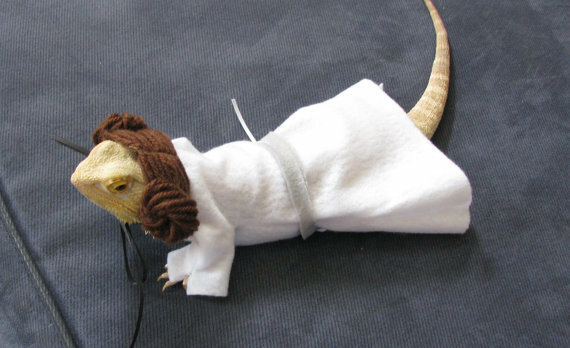 Your bearded dragon can now be Princess Leia, I mean how amazing is that? It is almost like Princess Leia is sitting in a terrarium in your house, holy Yoda! I´m telling you, my asthma inhaler was used after finding this costume. I´m such a Star Wars fanboy. 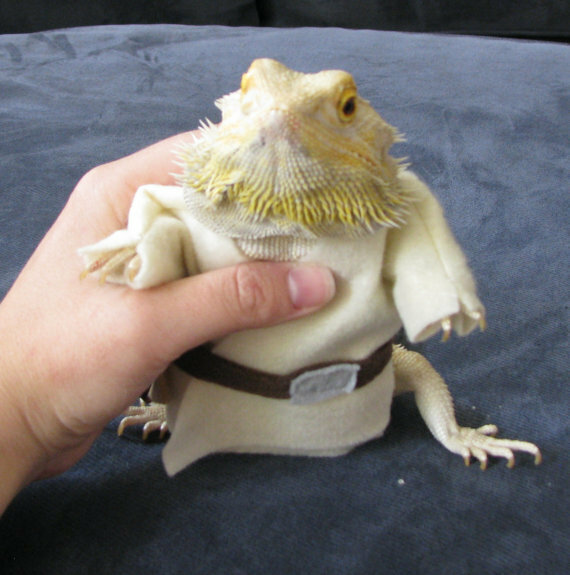 A Luke Skywalker costume for beardies? Wouldn´t it be great if you could pick up your dragon and say: “Beardie, I am your owner!” after you slashed it´s hand… no, stop! Do not do that! I really had to laugh when I saw this costume. The idea itself is funny as hell, but when you see how perfect this bearded dragon in this costume looks, it is soo hilarious. Another awesome costume! In my opinion a perfect costume for our little dragons. Beardies are so calm and relaxed. I am really starting to believe that bearded dragons must be from Hawaii. 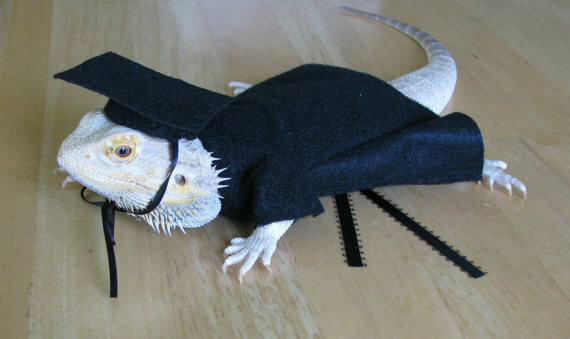 Can you imagine how it would look when your bearded dragon does a head bob in this costume? lol. This is a very simple costume, … can we even say costume to this? Whatever! In my opinion this is one of the best costumes I have seen. It is just a collar, but I think it fits sooo good. 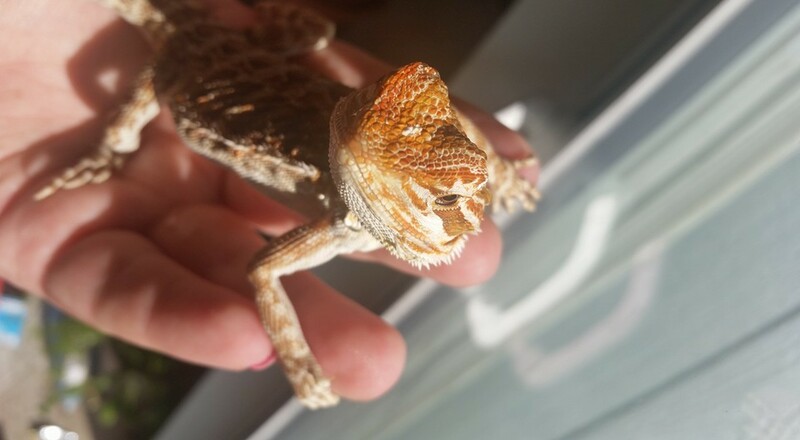 What to do if my dragon is too skittish for that? Normally bearded dragons are pretty calm right from the start. I once had a bearded dragon that jumped on my hand when I purchased it from the breeder. 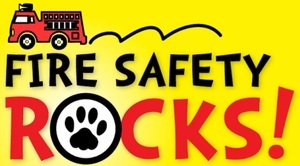 However there are some individuals that are more shy and do not want to wear costumes, leashes or harnesses. There are definitely ways to get your dragon used to the costume. I always do it like this: If I purchase new costumes for bearded dragons, a leash, a harness, or any other new thing I want my bearded dragon to get used to, I just place that object near the terrarium of my bearded dragon. I think I mentioned this technique pretty often in my articles, but I do that, because it is so effective. After a couple of days near that object, your bearded dragon will get used to it and you won´t have such a hard time to put it on your dragon. 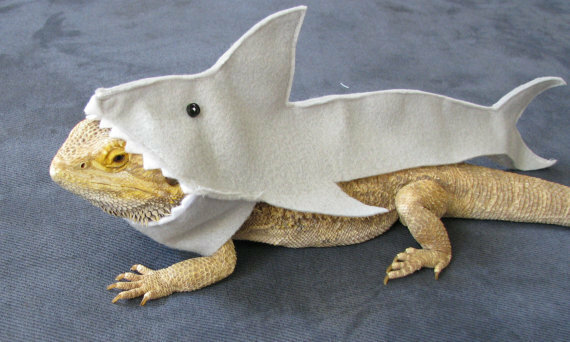 Always remember, if your bearded dragon absolutely do not want to put the costume on and completely freaks out, you should respect that. Reptiles can get stressed easily and that can cause health problems and I am sure that is not what you want. However most of you won´t have any problems putting the costume on, since your beardies are probably calm as hell, lol. What do you think about bearded dragons in costumes? 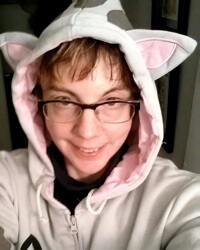 Are you also a little bit geeky and bought some costumes for your dragon? Which one did you buy? Which one is the best in your opinion? Tell me about it in the comments below! Are you often the odd/cool person in your friend group? Are you a person that like to do things differently from the rest of the world? 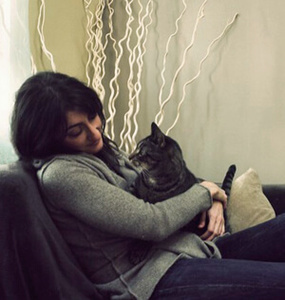 Do you find yourself wanting a pet but find dogs and cats are just too generic? 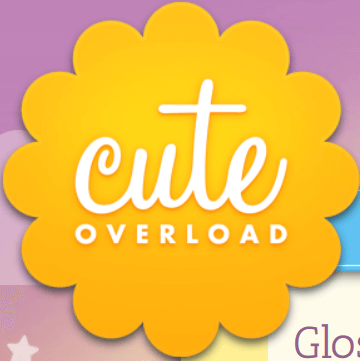 They are ‘cute’, but not ‘cool.’ You want something different. If you are one of those people, you should consider having bearded dragons as pets. They are magnificent creatures. If you are an newbie or never even heard about the bearded dragons, this bearded dragon care guide will tell you everything you need to know about this popular pet reptile, from what they are, how to choose one, to taking care of them. Bearded dragons are non-toxic, non-dangerous reptiles. Where do bearded dragons come from? They are Australian native who come a long way from their original continent and spread around the world right now. 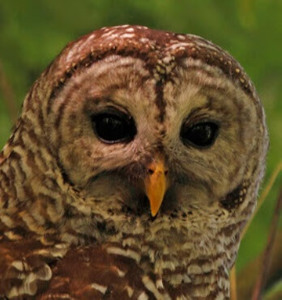 They get their names from a special territorial behavior of the male. The male, when protecting their territories while stretch out the skin in his throat and the throat turns black, making the dragons look like they have a beard. Bearded dragons sound pretty wild so do bearded dragons make good pets? The answer is yes. 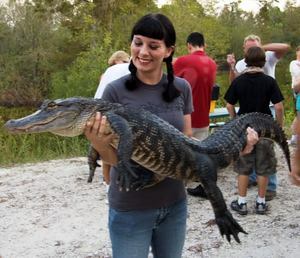 For the last 20 to 25 years, they are the most popular reptile pet in the world. There are thousands of people having pet bearded dragon, and this number does not show any sign of stopping. 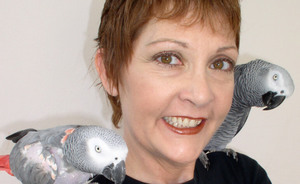 They are non-toxic, non-aggressive creatures and very animated and entertaining to watch. Bearded dragons are much more popular than you thought. Choosing a type of laundry detergent from grocery store is already difficult, not talking about choosing a live creature that will live with you for a long time. Choosing a perfect-for-you bearded dragon baby is not an easy task. It will take patience, carefulness and sometimes luck as well. This bearded dragon care sheet will start off showing you how to find a great reptile friend for yourself. Where To Buy Bearded Dragons? Breeders – This is the place you can often find the best quality bearded dragons. Breeders are normally experienced and they will support the dragons with the best and most suitable living and breeding environments. Thanks to that, the bearded dragons from breeders are not only healthy but also can be especially exotic with multiple shades and colors. However, the bearded dragons from breeders are more expensive than other places. 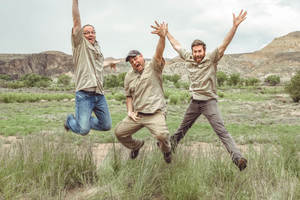 The breeder is a type of exclusive bearded dragon collectors club that deliver the best reptiles with the highest price. Pet Stores – If you don’t have any interests in your bearded dragon pets being the most stand out ones, you can simply visit your local pet stores. This would be the easiest way to find a bearded dragon pet. 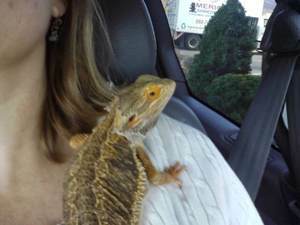 There is no guarantee that every pet store will have bearded dragons so try the bigger ones instead of smaller stores. However, there are downsides of pet stores. The beardie will be cheaper at the pet stores than at the breeders’, yet they are still expensive. You won’t have much variety of color to choose from the pet store. Besides, just like cats and dogs, people often concern that pets from pet stores are normally not as healthy as the beardie from professional breeders. 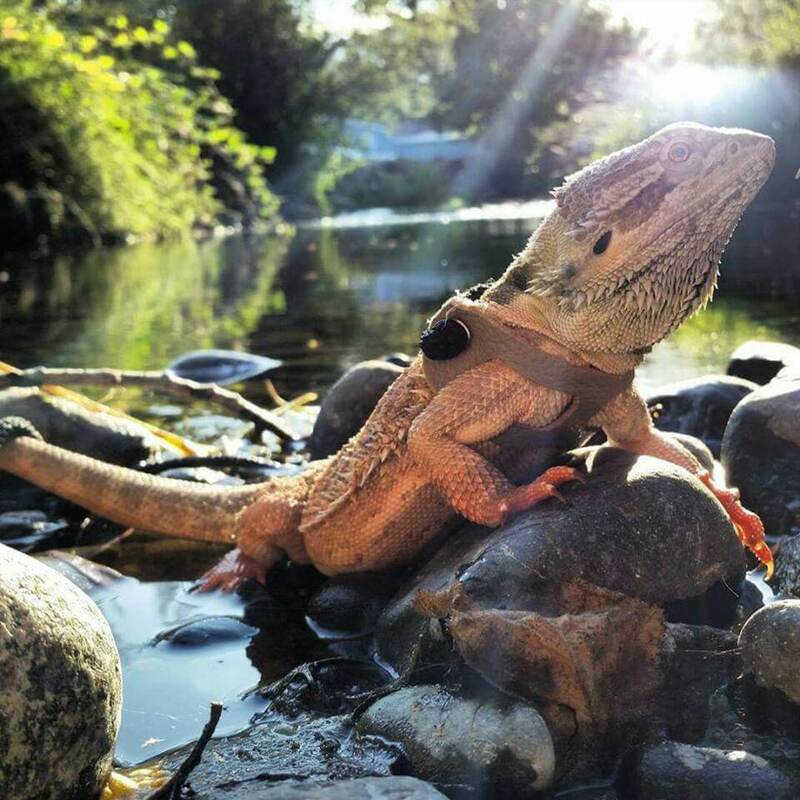 Reptile Rescues – This option is for more experienced beardie owners. 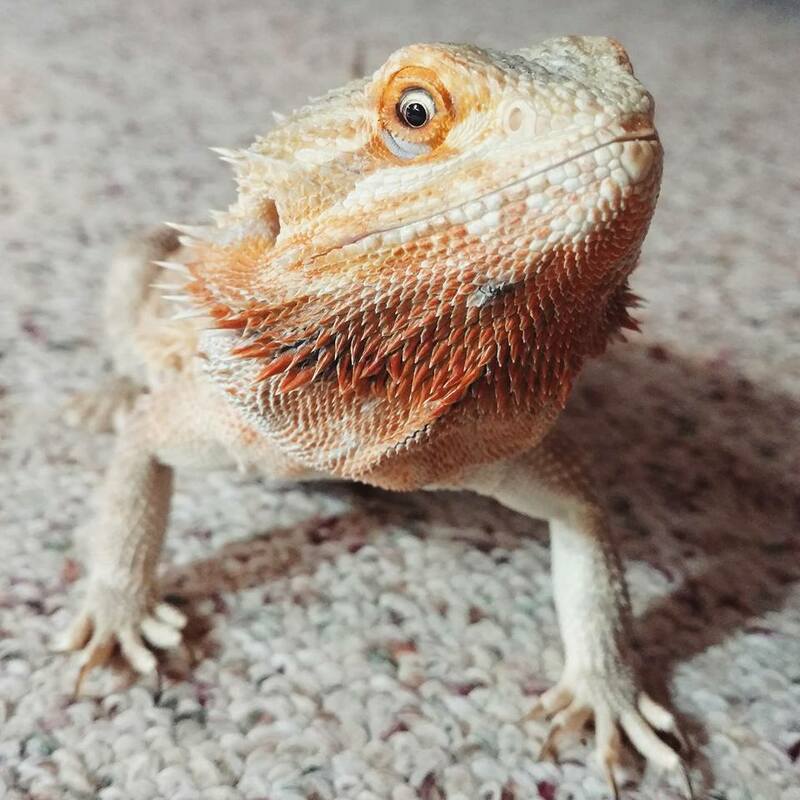 If you have experience taking care and owning a bearded dragon before, you can find yourself an extra precious pet while doing a good deed by adopting a beardie from the reptile rescue centers. 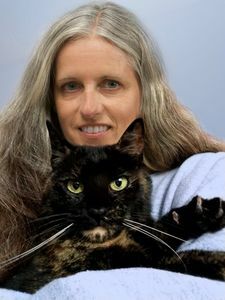 Because rescued pets are often more sensitive and fragile than usual due to long history of neglect and mistreatment, you need to know well what you are doing before adopting one. 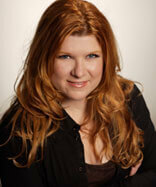 Online Stores – One of the newer options here. More and more online pet shops offer shipping of reptiles. 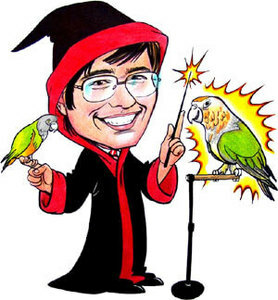 You can watch a lot of videos on Youtube where people unbox their reptile that they have ordered at an online pet shop. 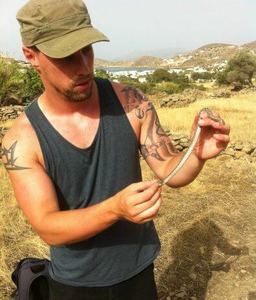 Other than expected the reptiles always arrive healthy and without a scratch. Adult or Juvenile Bearded Dragons? Now come the question of age. Should you get a young bearded dragon or a more mature one? we can’t answer this question. There is not really a should or should not option for this question. This totally depends on your taste, needs and preferences. Adult bearded dragons are easier to care for. They are less fragile to the environment. You have to check their owner’s history for complete information about their past though. But they are older so you may have less time to spend together with your precious pet, because of life span. In general, we recommend first time owners to choose adult bearded dragons since they do require less care. However, again, this all depends on you. Choose what you feel is best. How to choose a healthy bearded dragon? You would want to make sure you can get the best bearded dragon before actually purchasing it. It will take a thorough inspection, looking at every aspects of the beardie that you can see. However, the inspection may take a little time but they are not difficult. You just need to know what to look for. And that is what this bearded dragon care guide is here for. You remember those stories you were told when you were a kid about how when a lizard loses its tail, it will grow back again? Yeah, that is not the case with our bearded dragon. If the beardie loses a tail or a limb, he will stay that way forever. That’s the truth. Don’t believe if the seller tells you differently. However, it is also not unusual that the bearded dragon loses a little tip of their tails of toes, and choosing to go with their perfect imperfection or not is totally your call. 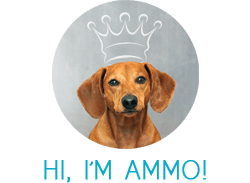 Besides the obvious effects of losing a limb or tail, losing a body part does not affect the animal’s internal health or general wellness. You need to check for injuries or wounds of the bearded dragon that may affect his/her future. If there are some wounds, check to see if those are completely healed and whether or not they are infected. Wounds, if not treated carefully can severely affect the beardie’s health in the future. Unlike cats or dogs, bearded dragon behaviors are not the obvious clue about their health. You need to check their heads to see if they are sick or not. Look for any puss or fluid around their mouths. The presence of puss and constant fluid around their mouths often indicate some bearded dragon illnesses. Besides, you also need to check whether or not their eyes are droopy, that can also be a sign of bad health. And finally, don’t forget to make sure that their mouth and jaw are not swollen or in ill-shape. Because of their lifestyle in the natural habitat, bearded dragons are very alert. A perked up and highly aware of their surrounding bearded dragon is often a healthy bearded dragon. Yet, on the other hand, not even the healthiest dragon can stay fully alert 24 hours a day. They get tired as well. So checking for alertness is a job that takes more effort than just a 5 minutes quick check up. Here is our checklist for new bearded dragon owners that you should read before buying a bearded dragon. Bearded dragons are Australian native. They are used to living in hot and dry desert environment. So just having them crawling around in our human air-conditioned environment won’t do them any good. You need to create a living environment that mimic the bearded dragon’s natural habitat in the wild to keep them alive and healthy. That is what this bearded dragon care sheet will show you next: showing you how to create the best environment tank/habitat for your precious bearded dragon? You could also save you some time and just have a look at our Bearded Dragon Tank Setup Guides. We compiled a complete habitat for you, including the right lighting and the right substrate for your dragon. No need for doing tons of research as a beginner. We did that for you! Click here for the perfect baby bearded dragon habitat! 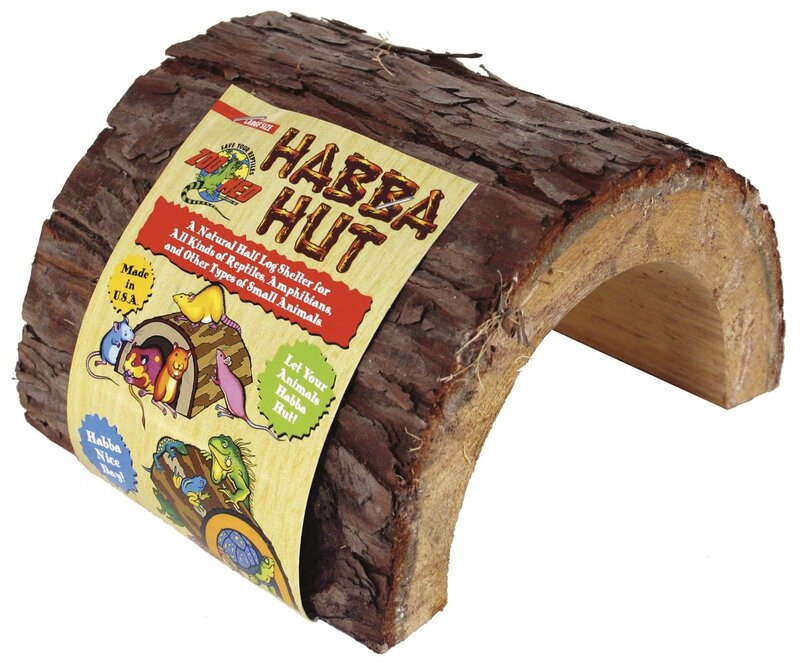 Click here for an awesome habitat for all bearded dragons! Like a fish needs a tank, a dog needs a cage, a bearded dragon will also need a tank. The first thing you need to pay attention for when choosing a tank is its size. It is absolutely important to not choose too small of a tank. The tank needs to be big enough for the beardie to be able to not only moves around easily but also has some extra spaces to feel comfortable. Having too small of a tank can cause anxiety issue for the bearded dragon and negatively affect their growth. The bigger the tank is the better. However, there will be some minor downsides of having too large of a tank. While caring for bearded dragons, you will realize that too large of a tank will give more space for the beardie to run around and also for their food (worms, insects, etc…) to hide. Besides, a tank needs to go with a few other accessories. So going big with the tank means having to also go big with all other accessories or else you can’t control the environment in the tank the way you want it to be, especially with the suitable temperature for your bearded dragon. For the most basics, you always need to choose a rectangular tank. They only need to be about 16 to 20 inches in height. It can be as wide as you want, but it doesn’t have to be very high. Bearded dragons are not really big jumpers so you don’t have to worry. So mostly you just need to concern about the width of the tank. Here are some guidelines regarding size of the dragons and the tank size. Baby bearded dragon will ideally need about 20 gallon tank size. 10 to 16 inches dragons will require 40 gallons or larger. 16-20 inches dragons need at least 50 gallons minimum. The most ideal sizes for them is 75 gallons. With dragons that are longer than 20 inches, they need to have at least 75 gallons space or even 120 gallons and larger. Bearded dragons enclosure come in many different types. Besides the most basics shape, there are many options you can choose for your tank. You can go as classic, simple or as fancy, showy as you want. You will recognize this tank immediately since they are the typical fish tank you often see. They work great for bearded dragons as well. They are by far the most popular because they are cheap, good looking and easy to find. The downsides of this tank are that they are pretty heavy, you probably won’t be able to move it after you set it up, and they don’t hold heat too well. The melamine tanks are great bearded dragon cages. They are often made from melamine board which is a type of wood. You can buy these melamine cages pre-made online or have yourself a DIY project. Melamine boards can be easily purchased from your local hardware store. Because of the white color of the melamine, these cages reflect the light making the beardie’s color looks very vivid and some owners even say these cages make their dragons happier. PVC cages are technically just melamine cages but with plastic instead of wood. Made from plastic so these PVS cages are light and easy to move. You can even stack them up on top of each other to save space if you have more than one dragon. Also, since they are made from plastic, you can choose pretty much any color you want as well. These are the most ‘professional’ looking cages that the bearded dragon breeders often use to display their dragons. They are made out from molded plastics (not just PVC and you most likely can’t self- build this cage) to give you 100% viewing of the dragon. They are light, easy to clean and often come with bearded dragon lighting built in the cage. To build a good bearded dragon terrarium, you will need more than just a tank. You will need other accessories such as lights, flooring, covers, etc…Remember you need to build a mimicking living habitat for your dragon, not just dropping it in the tank. So choosing appropriate bearded dragon supplies and accessories is very important. If you have an open top tank or cage, you need to get your tank a lid or else your bearded dragon will escape from the tank. Also, having a lid will help keep other pets, insects or objects getting into the tank and annoy or harm your dragon. This lid cannot just be a solid piece of plastic or wood panel. You need to let air easily flow in and out of the tank so your dragon can survive. 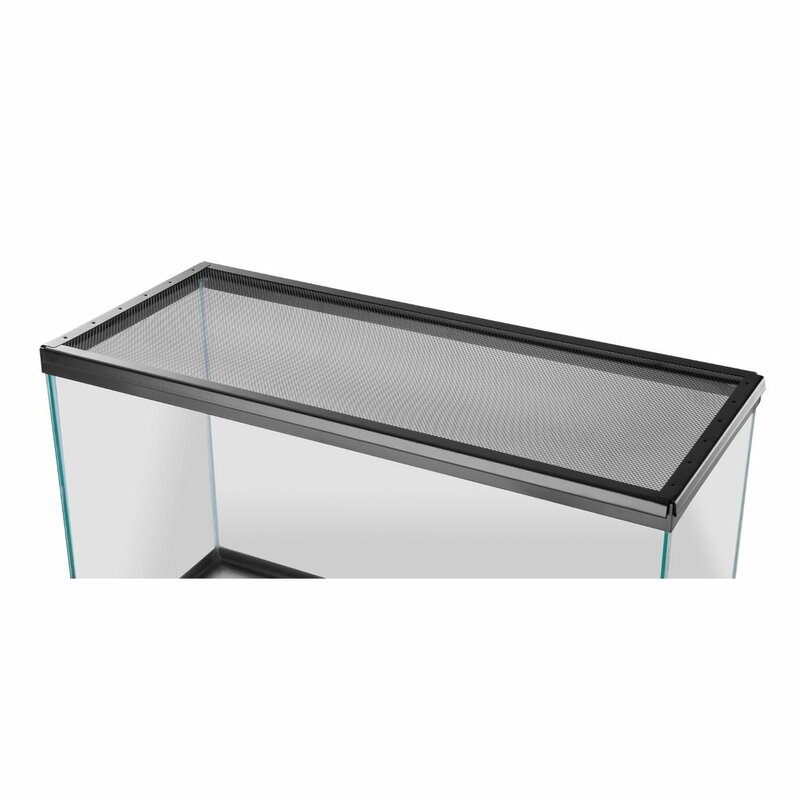 Any type of lid that restrict air flow is a huge no-no for your tank. Having a solid lid also captures the humidity within the tank and for a creature that is used to living in dry environment, the high level of humidity can easily make the dragon sick. Get a specialized screen cover for your tank. Bearded dragons are originally from deserts where there is a great amount of sunlight. They rely on the light heavily to stay healthy so you can just leave them next to the window and hope some weak sunlight will be enough for them. You need to install a full spectrum UV light (which emits all types of UV rays like the sun) inside the tank and turn it on for 12 to 14 hours a day for your dragon to be healthy. Besides the lighting, there needs to be another light inside the tank to keep the dragons warm so keep that in mind while installing the lighting to give enough space for both lights later. The best rated full spectrum light for bearded dragon is the Reptisun ﻿﻿﻿10.0. The light receives many positive reviews from bearded dragon owners claiming that the light does not help with the dragons’ health but also with their color. Tired of doing your research about the best dragon lighting? Click here for our bearded dragon lighting guide. We compiled the perfect lighting setup for you there! As you already know by now, bearded dragons’ natively live in desert environments. They can’t handle cold and prefer warm to hot temperature. His/her surrounded environment in the tank cannot be cooler than 85F and no warmer than 110F. That is definitely not your house’s temperature. So you will need to install a heat lamp inside the tank to provide suitable temperature for your dragon. You will need basking lights in this situation, to be exact. If you tank is long enough, you can virtually split the tank into two sections: one with the basking light, and one without so the beardie can run between the two for comfort. Basking lights are technically just heat lamps that focus all their heat into one specific section instead of spreading the heat around. It is important to have good basking light since this is vital to your dragon’s health. You often here stuff like: “Do not use just regular light bulbs since these lights need to be turned on for more than 10 hours a day and they can get really hot or even explode and injured the bearded dragon. We recommend only high quality basking light bulbs only.”, but in our opinion all that can happen with the popular reptile heat lamps as well. In fact the most popular basking lights are known for burning out quickly. Read our lighting guide for more information. You will need to monitor both temperature and humidity in the tank. You don’t have to do any extra step to control the humidity level inside the tank. Yet, you still need to keep an eye on it to solve any issues if the humidity levels suddenly skyrockets. 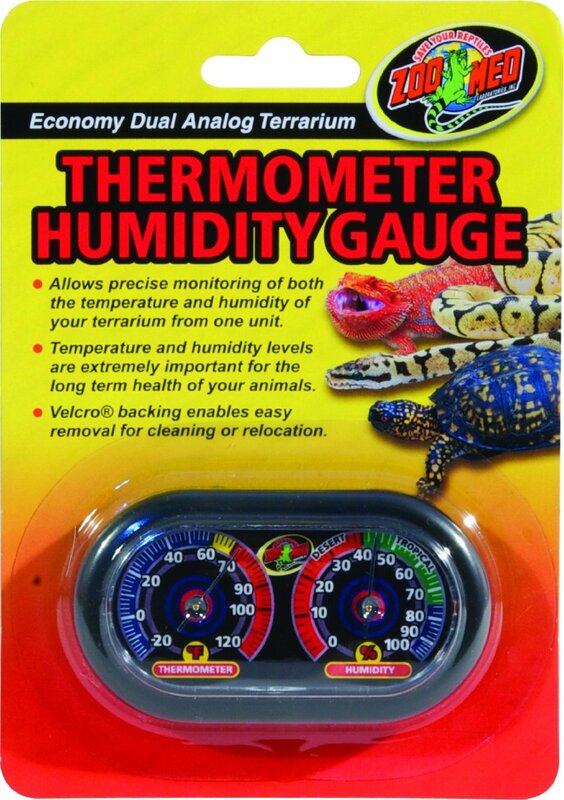 We recommend you to get a temperature and a humidity gauge. If earlier you separated your tank into a with-basking-light and without-basking-light sections then you should get an extra temperature gauge: one for each side of the tank. Or instead of having to buy every gauge separately, you can just get one gauge that displays both temperature and humidity on one screen. Choose whatever works best for you. You will also need to build a flooring/bedding for the tank. You can’t just let the poor bearded dragon run around on a glass surface. However, you also should not go too far decorating the floor. We recommend you not decorate your floor with loose materials such as sand, wood chips, pebbles or something of the sort because bearded dragons can eat the substrate. What you can do is layering the floor with reptile carpet. If you can’t find any, newspaper, paper towels or butcher paper will work as well. However we really recommend the substrate on the right – T﻿﻿﻿he Excavator Clay does the job better than all the other substrates or carpets. 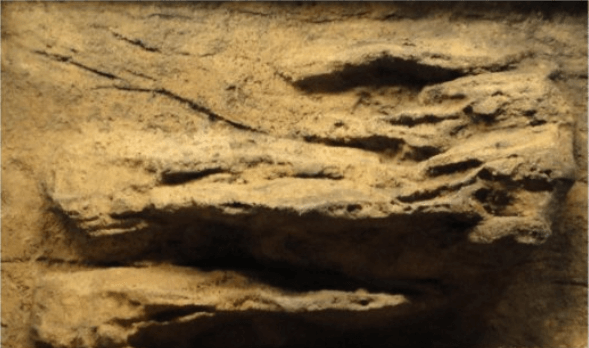 If you wanna know more about it and why it might be the best substrate for bearded dragons – Click Here! This is not necessary if you already have the basking lights. The under tank heaters allow you to heat up the tank from the bottom. The heat will rises up and keep the whole tank warm. 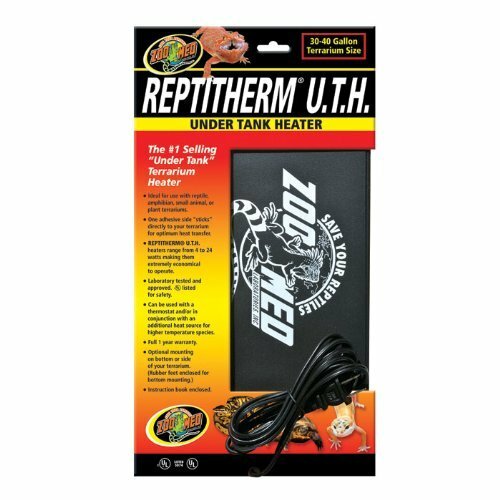 Many owners use these heaters to keep their dragon warm overnight without the lighting from the light. Generally, this is optional. However, they are more important if you live in somewhere very cold or often let your house’s temperature fall below 60F. Living in an exposed tank is hard, even for a bearded dragon. So inside your tank, you should have a hide places so the beardie can have some privacy. The beardie can go into the hide for some privacy, feeling secure or hiding from the lights. They are important for the mental life of your beardie. You can purchase pre-made hides that looks like real rocks in the future or make some yourself. Remember to make or choose hides are large enough for the dragon to move around inside. If the hide is too small, it is uncomfortable and the bearded dragon will not use it. An extra accessory for a happy life for bearded dragon is a reptile hammock. Bearded dragons love climbing and parching on things. They love having somewhere to do that in their habitat. Getting them a reptile hammock will let them have something to climb on and even rest on. 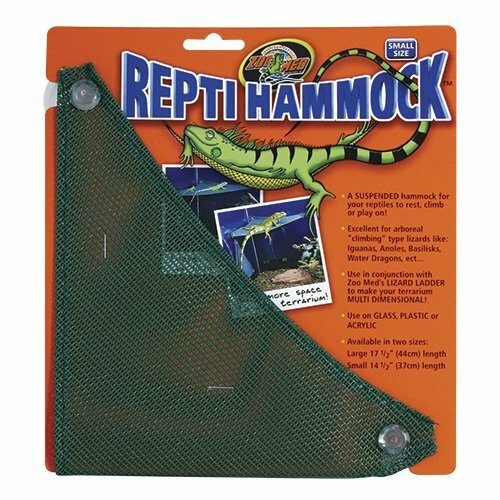 The reptile hammocks are relatively cheap and very easy to install. They have suction cups that can be attached on the tank walls easily. 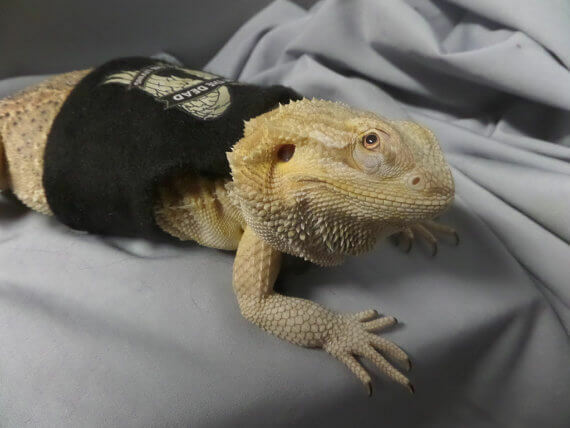 Click here to read further why hammocks are so great for bearded dragons and what you can do with them to train your dragon. Besides hammocks, you can also put some wood branches inside the tanks so the beardie has more places to climb. The branches are also great for decoration so you can customize your tank as much as you want so the tank looks natural and the dragon feels more at home. Of course, you should not overdo it because that will leave no more space for the dragon to live. Before putting a branch inside the tank, make sure to clean it thoroughly, and strip off all wood chips and insects inside the branch. A basking platform is a place right underneath the basking light that can hold heat, so the bearded dragon can sunbathe on it for warmth. It can simply be a rock, a tree branch or you can combine by placing the hide right beneath the basking light and the bearded dragon can just rest on top of the hide. If your basking platform is a rock or a hide, choose the dark rocks since they absorb heat better and they will stay warm to the touch. Bearded dragon once laying on it can get warmer. The most important point of the bearded dragon tank is that it mimics the reptile’s natural habitat. So you should not let the poor creature has to keep looking at the blank white wall all the time. Get a scenario background for your tank so the bearded dragon can feel like it is living in a desert. Many bearded dragon owners claim that their dragons are happier with a background. Click here to see our favourite backgrounds! After you are done with setting up the perfect tank for your dragon, let’s move on to the dragon’s food and diet. Feeding the right food with a reasonable amount will help the bearded dragon be happier, lives longer and be healthier in general. This section in bearded dragon care guide will show you what you need to know to feed your dragon best. What can bearded dragons eat? Bearded dragons are omnivores, which mean they can eat both insects and vegetables. Each dragon differently will have its own preference but health-wise, neither type of diet is better or worse for your dragon. Your bearded dragon’s diet will depend mostly on age. Younger dragons will eat more insects and less vegetables, about 80% insects and 20% vegetables. The adult dragons are the opposite: 20% insects and 80% vegetables. Besides the types of food, you also need to pay attention to the size of the food. If you feed your dragon anything wider or larger than the gap between his or her eyes, he or she is very likely to be choked or injured by the piece of food. So you need to make sure the vegetables are cut into small pieces and the insects can’t also be too large. Young bearded dragons need lots of nutrients to grow, that is why they will need more insects. Young bearded dragons do not only need more insects, they also prefer insects over vegetables. Like human kids, it is sometimes difficult to make young bearded dragons to eat their vegetables. Every day, you should feed the young reptile as many crickets or insect within 10 to 15 minutes. Do that 3 times per day. After these feeding sessions, remove all uneaten insects out of the tank and leave vegetables inside when they are still awake. You can expect young bearded dragon to eat about 20 to 60 insects a day. Adult dragons eat less insects and more vegetables than the young ones. It is less entertaining to watch but it will save you much money since vegetable diet is much cheaper. The main diet for an adult will mainly be vegetable and once a day insects. You should not overfeed the adults with insects since they can be overweight and unhealthy. 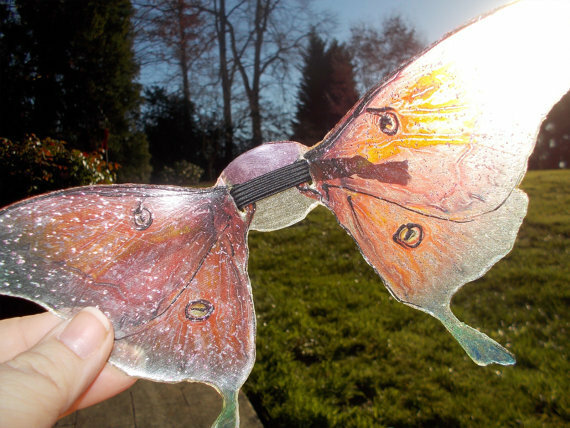 You will feed them insects the same way you do with the young ones. Feed them once a day but during the 10 to 15 minutes period, let them eat as many insects as they can. Remove excess insects after the meal. Bearded dragon live food should be safe and good for them to consume. However, you bearded dragon will be like your kid. He/she will not know what is good for them and what is not. They will eat just about any insects or bugs that crawls by them. So you need to know what is good for them to keep them healthy. 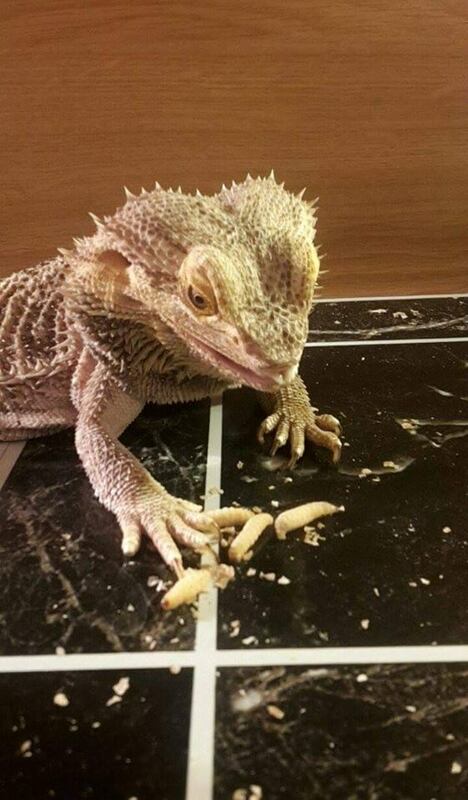 You cannot feed bearded dragons the bugs you randomly find in your house or the ones you buy as baits in Fish shops. These bugs can carry parasites or filled with insecticide. Eating them can be lethal to bearded dragons. Do not risk it. You should only buy bugs that are specifically breed for feeding pets from pet stores or insect breeders online to make sure your bearded dragon will not end up being poisoned. 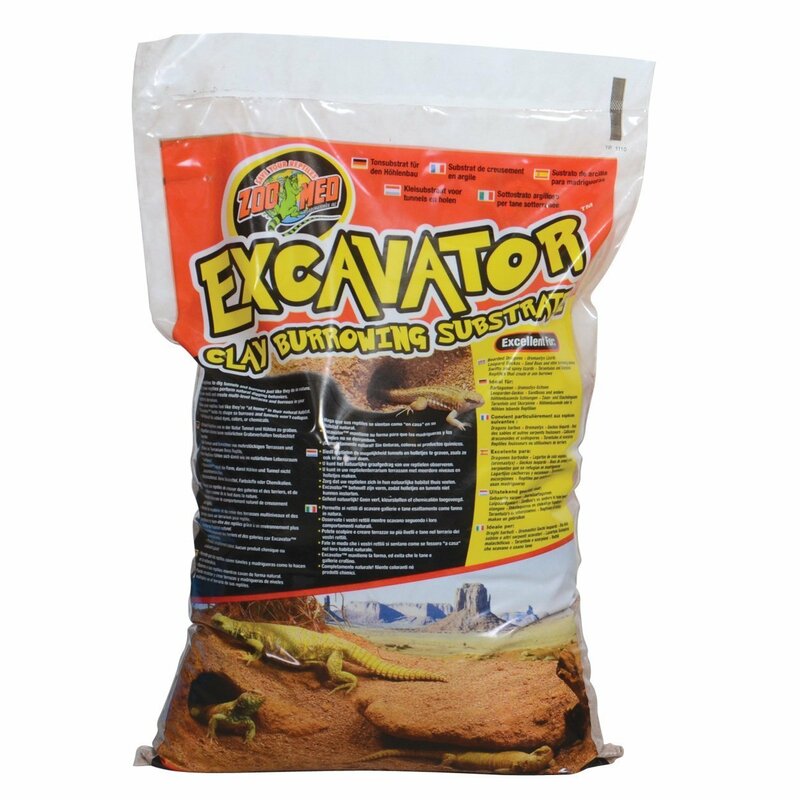 Here is the list of the most popular and easy to find insect feed for your bearded dragons. You can find more information on our article about feeding bearded dragons. To be honest, watching your beardie eating vegetables is nowhere near as exciting as watching them eat live insects. However, vegetables and fruits contain necessary vitamins and minerals in order to keep your beardie healthy. That is why even young beardie whose main diet is insects still need to eat a certain amount of vegetables. Not to mention, vegetables are much cheaper and easier to obtain than insects. Bearded dragons can eat both vegetables and fruits. Here is the list of most popular vegetables for your bearded dragons. You can feed any of these vegetables at any meal of the day for your dragon. There is much less restrictions on feeding vegetables to your dragon than insects. Compared to vegetables, fruits can be more tasty since they are sweeter and more flavorful. Combining fruits in the meal can encourage some picky bearded dragons to eat more plants in general. Here is the list of popular fruits fed to bearded dragons. Need more information about this topic? No problem! Here are 88 things your bearded dragon is allowed to eat. We have talked about the to-do. Now, let’s not talk about the Not-to-do with feeding your bearded dragons. Not all insects and vegetables will work with feeding bearded dragons. There are some dietary restriction. We have mentioned about this earlier. Do not feed your bearded dragon insects that you catch yourself from the wild. 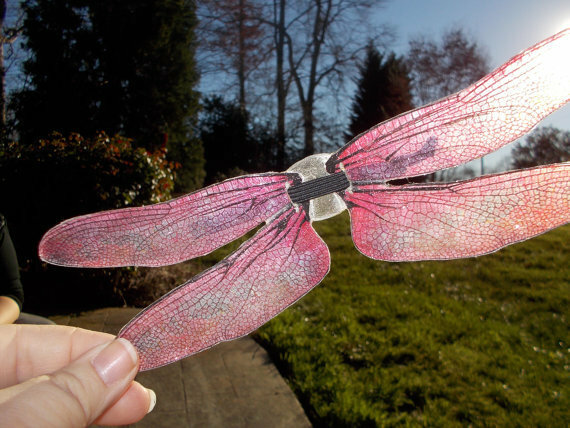 These insects are not ‘clean.’ They very likely contain parasites and pesticides that can make your dragons very sick. Basically, do not feed any insects that can make itself glow to your bearded dragons. The chemical that cause the glowing in those insects are highly toxic and lethal to your bearded dragons. Avocado is toxic for bearded dragon. Why it is toxic and what is its toxic level for bearded dragon is unknown but if sometimes, it can be dangerous enough to kill your dragon. There are plants that are toxic for bearded dragons. Some of these plants are easy to guess since they also have toxic effects on human like: marijuana, poison ivy, tobacco, poppy, etc…But there are more plants that can harm your bearded dragon like daffodil, poinsettia, sweet pea, tulip, etc…We highly recommend you to check thoroughly before deciding to feed your dragons with something off-track from the usual diet. Your bearded dragon needs a stable supply of vitamins and minerals to stay healthy. Here is how you can be sure to give your dragons the right amount of vitamins and minerals. Bearded dragons can be vitamin A poisoned. However, it is not common and also not likely to happen if you feed them organic, natural products such as carrots as the main source of vitamin A. Bearded dragons most likely be having too much vitamin A from multivitamins containing synthetic vitamin A. When eating natural food, if the dragon happens to consume too much vitamin A, its body will automatically excrete the excess amount of vitamin A to keep itself healthy. However, with synthetic vitamin A, vitamin A will be absorbed directly to their body without having a chance to ever be excreted, which can cause a toxic level of vitamin A. Normally, just the vegetables in their meal is enough iron for the dragons. However, if you bearded dragon is still young and does not eat much vegetables, you should consider getting an iron supplement to maintain a healthy iron level for your pet. Normally, in the wild, bearded dragons can just get vitamin D3 from sunlight but since we are keeping the dragons indoors all day, we need to supply them with some vitamin D3 and calcium supplement. 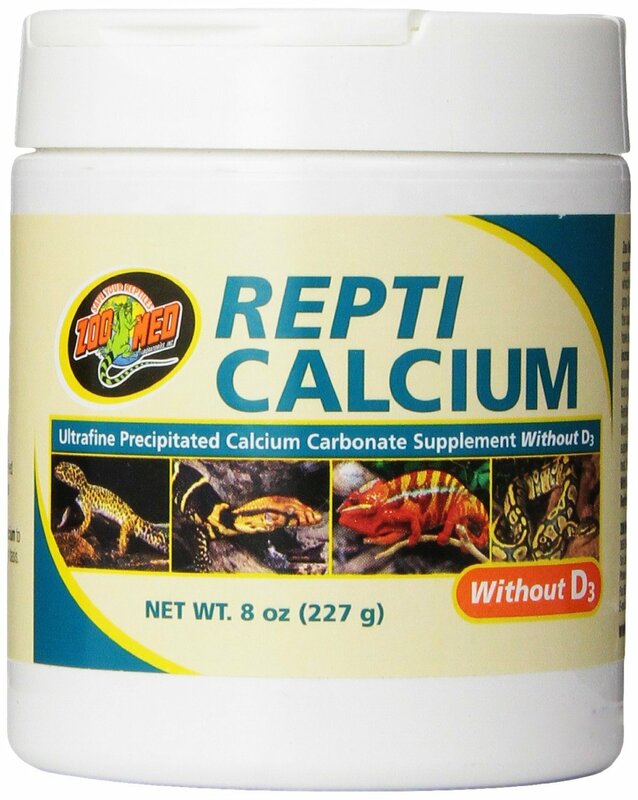 If your dragon often has contact with direct sunlight or you use a full spectrum UV light inside the tank then you don’t have to give your dragon this supplement. Generally, for baby bearded dragons, you need to feed them the supplement daily. With juvenile bearded dragons, the supplement only needs to be fed 3 to 4 times per week, and with adult dragons, one dose per week is enough. Most vitamin D3 and calcium supplements will also have phosphorus, and you don’t want your dragon to have too many of those. So before purchasing, choose the supplement that contain low level of phosphorus. Bearded dragons are generally very resilient and healthy animals. However, they can still be sick sometimes. Before looking into potential sickness-related-behaviors, let’s look at a few common behavior of bearded dragons that can cause false alarms for inexperienced owners. Brumation is like semi hibernation routine for bearded dragons. In late fall or early winter, bearded dragons often brumate due to changes in lighting and temperature. During brumation, bearded dragons will become less active, decreased appetite. They may sleep for days and skip multiple meals. They do wake up once in a while to eat and walk around though. However, their main purpose during this period is rest. So you should not wake them up while they brumate since it can make the brumation cycle gets longer and your dragon becomes tired due to lack of proper rest. Bearded dragons can shed from twice a year to once every month depends on their age. Younger dragons shed more often since they need to grow more frequently. When the bearded dragons begin to shred, their eyes will seem more puffy and their color gets dull. Don’t be alarm and mistake those as signs for ill health. If you want to help with the process, you can bath them more often of use warm damp washcloth to exfoliate the already loose skin that do not really attach to their body anymore. Do not peel off or picking at their skin since it may damage the new layer of skin. Further bearded dragons often time wave or bob their heads. As long as they do not do that all the time, it is absolutely okay. It is a sign of submission (waving) or dominance (head bobbing). Unusual behavior can be caused from internal sickness or health problems. Here are some common health problems that you can recognize from observing your bearded dragon’s behaviors. If your dragon eats well but has not used the bathroom for several days, it is likely that he/she has impaction issue. Most of the time, impaction issues can be minor and can be helped by gently massaging your bearded dragon’s stomach in a warm bath. If this does not solve the problem, you need to bring your dragon to a vet for more medical attention. If diarrhea happens once in a while then it is normal. However, if it happens often, you need to get more medical attention for your dragon since it can be a parasites or worms problems. Proper hydration is very important for bearded dragon since they live in hot and dry environment. If the skin doesn’t return to normal instantly once you press on their skin, it’s a sign of dehydration. When your bearded dragons’ eyes begin to droop, you need to contact your vet as soon as possible since it can be a kidney issue. Sometimes, bearded dragons can have some diseases that are more serious than others. In those cases, you need to seek proper medical attention as soon as possible. If the dragon’s habitat is too cold or too humid, he or she can have a respiratory infection. Symptoms are gaping mouth, breathing difficulties, puffy throat and sometimes whole body and excess mucus around the mouth and nostrils. MBD is the weakening of bones due to poor diet and lack of calcium and vitamin D3. Symptoms are: bumps in the legs and vertical columns of the back and tail, swollen lower jaw, twitches and spasms, and jerky movements. When your bearded dragon has a decreased appetite and there is a yellowish/white substance around the mouth, your bearded dragon likely has mouth rot since their mouth is swollen or some of their teeth are loose. 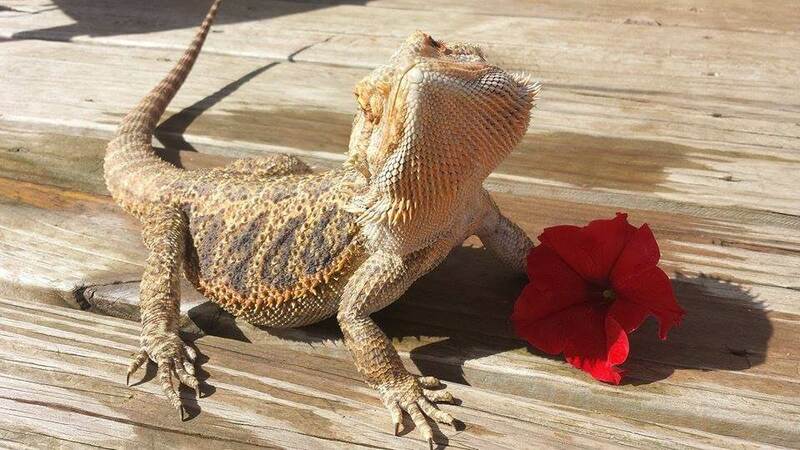 In order to have a healthy and happy bearded dragon, feeding him or her with good food and setting him/her up with good lighting and temperature is not good enough, you need to find your pet some things to do. Here are 5 activities and toys you can buy for your pet or do with your pet dragon. We know, we know that a bearded dragon is not a dog, and there is no scientific proof in anyway but apparently bearded dragon seems to like playing with balls. So buying a simple squeezy ball for your dragon to play with is not only good for his/her mood but also good exercise for him/her to move around. Yeah, tweezers are for the weaks. You guys feed your bearded dragons bare hands. Just kidding, that is not true. Feeding your dragons bare handed or with tweezers are just simply choice of preferences. 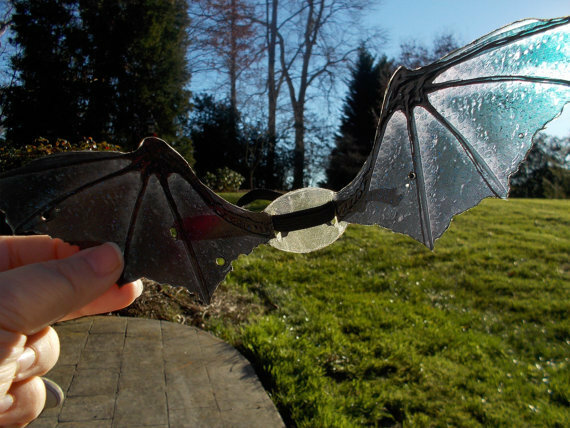 However, you can use a pair of long tweezers to play catch and chase with your dragons. 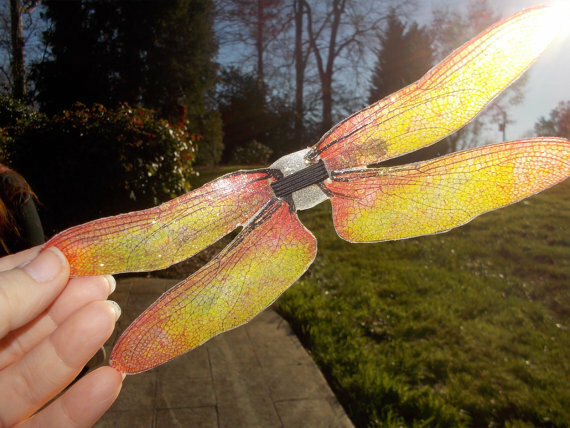 Grab a insect with the tweezer and let your dragon chase you as if he/she actually has to does it in the wild. Place a mirror near the bearded dragon tank and you will see he/she start bobbing its head or doing the bearded dragon wave. Bearded dragons are very territorial so seeing its own reflection will make them think there is an intruder in the area. It is healthy to keep the dragon stay in touch with its natural behavior. However, don’t over do it. Make sure to only expose the mirror a few times a day max. Cover it up for the rest of the day. Imagine you can take your dragon on walks. That is the amazing power of having a leash. Give your dragon a few days to get used to the leash so it won’t hurt itself on the actual walk. But after that, you are free to take him/her to infinity and beyond. Have a look at this awesome leash here. Whether you believe it or not, bearded dragons are great swimmers and they love to swim. You can let your dragon swim in your swimming pool, bathtub, big bucket of water or better yet, a real pond. Just remember to keep your eye on the dragon while he/she swims just in case. 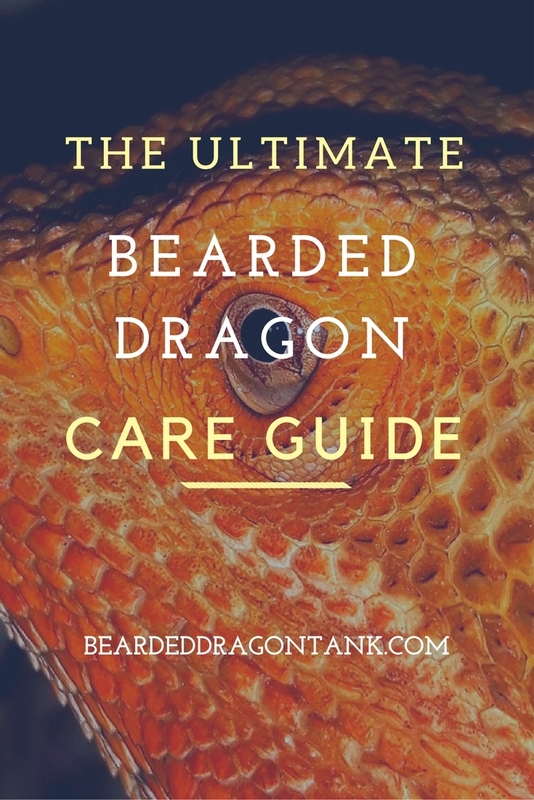 So there it is, a bearded dragon care guide that will definitely help you with your future in owning one or a few bearded dragons. Those are all the most basic knowledge you need to know to not stumble on any surprises or heartaches when you first start. 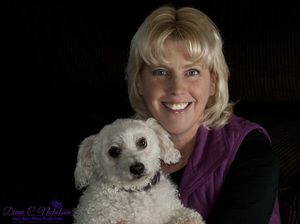 You can slowly enjoy the process while keep your little pet healthy and happy as well. However, this is just a beginner guide. Like anything else in life, practice and time will give you the most experience, and you can wander around more and upgrade yourself. Now, if you already have a bearded dragon, take good care of the little baby. If not yet, what are you waiting for, go get one and start this wonderful journey with us. If you need any help, we are always there for you. Just leave us your question in the comment section below and we will respond as fast as we can. Bearded dragons are one of the most popular pet reptiles in the world. Not only because they are cute, easy to take care of and look like a dragon. Nope! 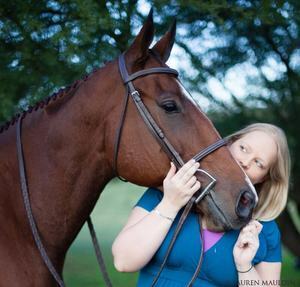 They are also very calm and most of them can be petted and handled right from the start, without doing anything. So of course this makes them good, so called “starter reptiles” and further they are awesome reptiles for kids. However there are some bearded dragons which do not want to be petted, handled or even looked at. Those beardies will bite their owners and get in full dragon mode as soon as a human get close to them. Others are pretty shy and hide whenever somebody gets too near to the terrarium. So if you visit this article, you most probably want to know how to tame your bearded dragon quickly. Good news! You came to the right website. 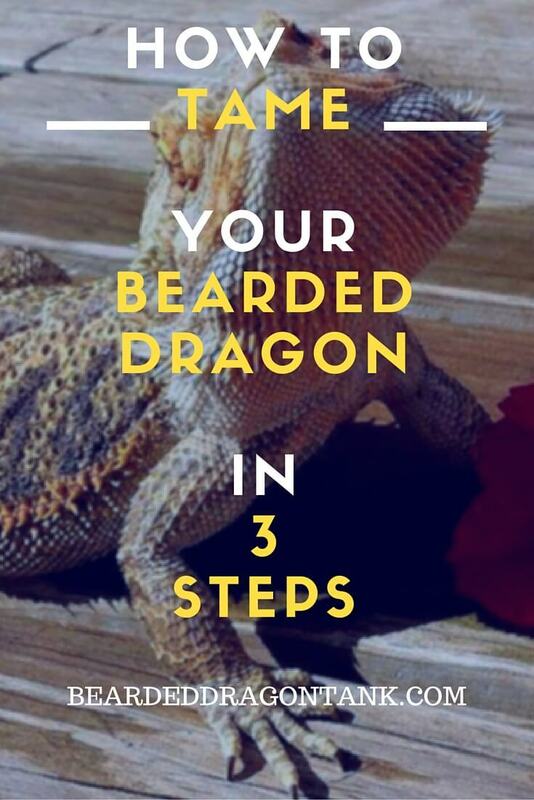 In this article I will show you that taming a bearded dragon is pretty easy and only requires three simple steps. Before we get right into things here, I just want to mention one thing. Do not believe anybody who tells you that your bearded dragon can´t be tamed. That´s just not true. Every dragon can be tamed. The first step does not require real action. No matter if your bearded dragon is totally aggressive or if it is shy as hell, it needs to get used to your presence. Whatever you do, do it near the tank of your bearded dragon. Don´t get me wrong here, I do not want you to carry your bearded dragon tank with you to the toilet so that you can always be near your dragon. Just do normal things near to the terrarium. If you watch TV, do it next to your bearded dragon tank. If you call a friend, sit beside the tank, so that your dragon can see you. Spend as much time as possible near your bearded dragon. There will be a point when the bearded dragon will see you as something normal. In fact this is the technique I use to get my dragons used to everything new and it works perfectly fine. When I bought a leash for my beardies I just placed the leash near the tank for a couple of days to let my dragons get used to the leash. Putting on the leash was sooo easy after that. When you feed your dragon, do you just throw the food into the dragons cave and hope that this sacrifice offering will not make it kill you? Yes? ….. Beeeeeep, stop it, now! Stop just throwing the food into the tank. If you really want to tame your dragon, you need to start handfeeding it. In the first couple of days, you should just place your hand inside the tank, so the beardie can get used to your hand in its territory. Especially with shy bearded dragons, this works great. Aggressive dragons might start to defend its territory and try to bite your hand. If so, you can skip this step, or put on a thick glove, so your dragon won´t hurt you. Please note, that you should not overdo it. If your dragon is attacking you all day, it will get exhausted and that might be too much stress for your dragon. Getting used to your hand also means that you bearded dragon should learn that your hand means food. So get your tweezers out or if you are very courageous feed your dragon with your bare hands. At first it might take a long time till your dragon will take the food out of your hand, but believe me, it will take it after a while. If it does not take the food, simply skip feeding and feed it the next day. The more hungry your dragon gets, the more it is willing to do to get the food. Please note that this will do no harm to your dragon. In the wild they are used to not eat for a couple of days if they can´t find or catch food. If you own a baby bearded dragon I would not recommend to skip feeding, since your beardie is growing and it is better if they eat every day. It most probably will not be necessary anyway, since they are hungry as hell every day when they are growing. Do not stop offering water!! Now we come to the final step. You should have already handfed your dragon for a couple of days. Your bearded dragons is more used to you now, since you are getting into that handfeeding you should take it to the next step. If you feed your dragon with your right hand, place your left hand under the food you are offering with tweezers (or your bare hand if you are badass), so that your dragon needs to step on your hand to reach the food. It most probably will be distracted at first and it will take a long time until it will be brave enough to step on your hand to get the food, but the hunger always wins. If it does not work, simply do as I have described in Step 2, just skip one feeding and feed it on the next day. Remember, the more hungry your dragon is, the more it is willing to do to get the food. On the second day without food, it most probably will jump on your hand without hesitating. Offering treats your dragon loves most, will make things easier. For example get some superworms whenever you want to train your dragon to get on your hand. Again, do not skip feeding if you have a baby bearded dragon or if you have a undernourished dragon. The health of your beardie is always the most important thing, never forget that. Handling a shy bearded dragon means a lot of stress for the animal. However sometimes you need to handle your dragon, for example if you need to go to the vet or if you want to clean the habitat. For shy bearded dragons even watching them can be too much stress for them and that´s not what you want. Too much stress will cause health problems, so in my opinion it is very important that your dragon stays calm when you are near the tank or if you need to handle it. Besides that you can do a lot more things with your bearded dragon if it does not freak out if you touch it. 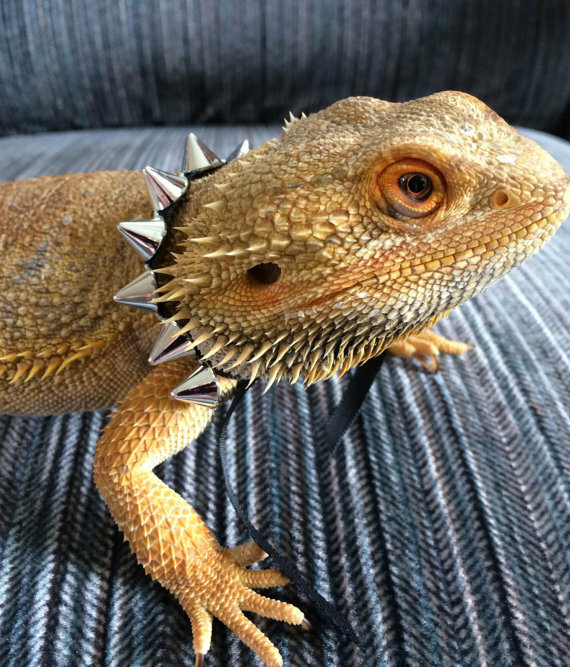 Just have a look at this article: 10 Best Bearded Dragon Activities And Toys. I have listed a lot of great exercises there, which are good for your dragon, since they prevent depression, boredom and sluggishness. Without taming your dragon, most of those exercises would not be possible. If you do it like this, your bearded dragon will get used to climbing on your body and it will become the calmest dragon you have ever seen. Just be patient, never give up, it will happen. Did you need to tame your beardie or was it already calm when you got it? Tell me about it in the comment section! If you need any help, just leave a comment below and I will get back to you as soon as possible. I promise! Have you ever heard of bearded dragon toys? No? Me neither until last week. A friend of mine, who is also in love with bearded dragons, told me that he bought some toys for his dragon now and that he is doing a little bit of playing and training with his dragon. Since I´ve never heard of beardies playing with toys, I was very curious what kind of toys bearded dragons actually use. With “use” I mean actually playing, or doing something with it. Since I am running this website here, I am always up for something new, I am always up for some experiments so I can share my new impressions with you guys, my readers. Besides that I also got two beardies and of course I want to entertain them. I think that bearded dragons really need something to do. They need a little bit of exercise. Not only for their physical health (most bearded dragons definitely get too fat in a terrarium because of overfeeding) but also for their mental health. Out in the wild they are doing stuff the whole day, like hunting or keeping other dragons away from their territory. What do they do in a terrarium? Right! Almost nothing. 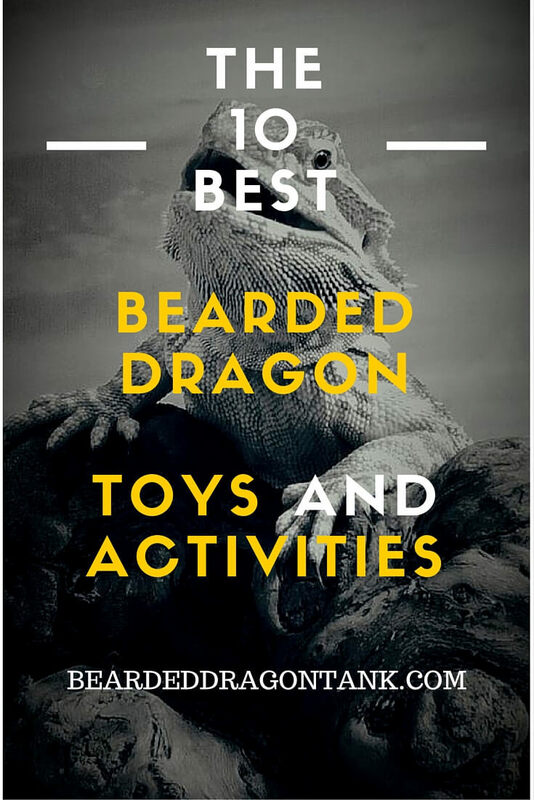 Here is a list for you of the 10 best toys and activities for bearded dragons. Hope you enjoy! I know it sounds simple and somehow unbelievable. Bearded dragons playing with balls? Well sounds like someone thinks that beardies are dogs, right? 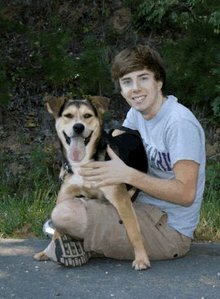 Well, maybe they aren´t that different from dogs as we thought, lol. In fact most bearded dragons really play with a ball. Do they enjoy it? I do not know, I don´t speak dragon language, but the dragon in the video below seems to enjoy showing the ball who´s the boss. So you see, dragons seem to like playing with balls, which is great. It is not only a great physical exercise for beardies, it also keeps them busy, which prevents them from getting depressed from sitting bored in the tank all day. Come on, who does not love swings? 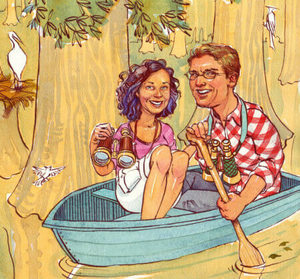 All humans on earth love swings and it seems like many animals also do. The bearded dragon is no exception here. They love to climb on it or just lie on it, looking around judging everybody, haha. This is also a good physical exercise for your bearded dragon. Due to the fact that the swing moves when your dragon climbs on it a lot of different muscles will be activated and trained. It is a better exercise for them then just climbing on a rock. If you want to buy a swing, you should make sure that it is made of good and save material. Swings of bad quality could hurt your bearded dragon. Unfortunately, there are not a lot of swings you could buy, which are made for bearded dragons. If you do not want to build a swing yourself, you could also do something similar with a hammock for your bearded dragon. Have a look at the article below where I have reviewed one of the best bearded dragon hammocks and explain what fun stuff you could do for your dragon with a hammock. Why you must have a bearded dragon hammock! 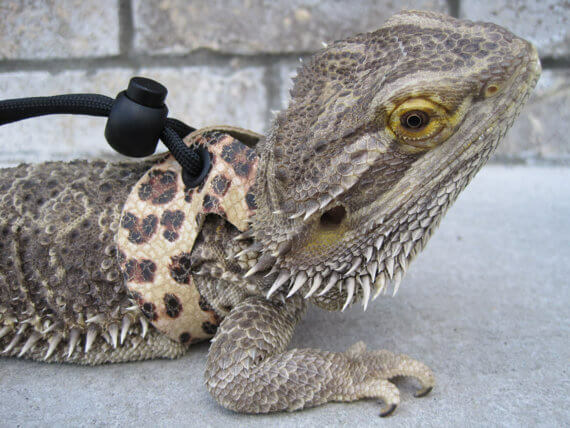 I was sceptical when it comes to leashes for bearded dragons. I was always afraid that my dragons might not like the leash and hurt themselfes when I put on the leash. However there is no need to worry about that. My dragons got used to see the leash a couple of days and then I could put it on without any problems. Just think about the possibilities here. You can take your bearded dragon for a walk, which is a great physical and mental exercise for your dragon. It prevents depression and the sunlight is sooo good for your bearded dragon. You can even let your bearded dragon hunt wild insects as long as you visit the vet regularly. Please make sure that the grass where your dragon hunts was not treated with pesticide. The dragon leash is really one of my favorite bearded dragon toy/ activity. 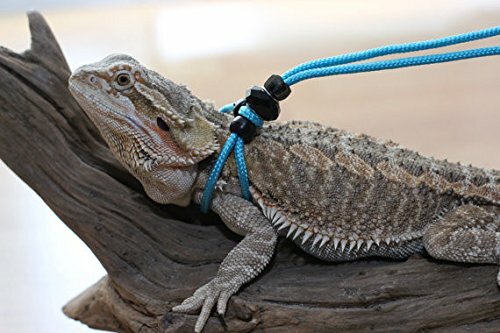 Besides that you can get a leash for your beardie for just a few bucks. 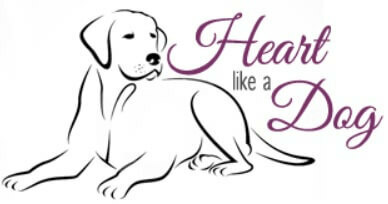 Have a look at this article, where I show you one of the best leashes for not even $10! Click here! 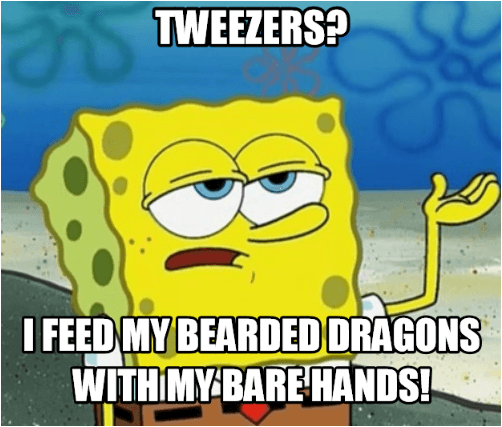 Yeah I know, most of you guys probably don´t need tweezers or don´t want tweezers, since you enjoy feeding your bearded dragons without that stuff. However it is not really about the feeding. Tweezers are awesome to play chase with your bearded dragon. Simply grab a cricket or a dubia or something like that and show it to your dragon. Of course, as you already know, your dragon most probably will freak out and try to catch the food. Let your dragon run, climb and jump and you will have a healthy bearded dragon. This is a great exercise for your bearded dragon, because you simulate nature here. In the wild bearded dragon hunt their food all day. Further this is not only good for your bearded dragon. I bet you are also going to have a lot of fun playing with your bearded dragon. Note: Please make sure that you don´t overdo it here. Play chase for your bearded dragon, but do not do it too long as it could be too much for your dragon at some point. Have you ever left your bearded dragon together with a transparent box full of crickets on the floor? If not, you should definitely try it out. Your dragon will hunt the box like crazy to get the food inside. It is the same as letting your dragon hunt food with tweezers, but just for lazy people, haha. Sounds weird, but is one of the best and most natural things you can do for your bearded dragon. Place a mirror near the tank of your bearded dragon, so that the dragon can see its own reflection. Observe your dragon. It will start to bobb its head or it will do the bearded dragon wave. That´s because the beardie thinks that there is an intruder. Bearded dragons are territorial and they want to scare away potential competitors, or they even show submissiveness by waving. I would not place the mirror near your tank all day. Maybe 15 minutes each day, so your bearded dragon is busy, but does not get stressed out. The rest of the day you can just cover the mirror with something like a towel for example. This also works with two bearded dragons in two separate tanks. If you place the tanks so that the bearded dragons can see each other, you will see their awesome territorial behavior. Just don´t place them too near to each other. Need a bearded dragon tank? Get a complete, cheap and ready tank here! You might not believe it, but bearded dragons are great swimmers and they love it! Have a look at this video below of a german guy who lets their dragons swim in his pond. Please make sure that you always keep an eye on your beardies while they swim. 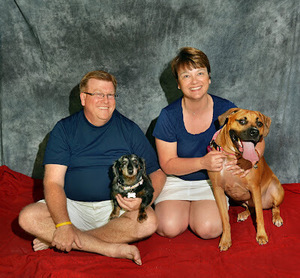 They are good swimmers and most probably nothing bad will happen, but you never know. I have found a great substrate for bearded dragons which is not dangerous and awesome for creating an extremely good looking bearded dragon habitat. You can find my article on this substrate here. With this substrate you can form hills and even caves in your bearded dragon tank. This way your bearded dragon can explore its habitat and it can even dig its own caves and tunnels. The great thing about this substrate is, that it is very cheap, it is very easy to clean and you can remodel it over and over again. So you can create a completely new habitat for your bearded dragon without spending over and over again. Most probably you are doing it already anyway, but it is definitely worth mentioning it in this list. Letting you bearded dragon climb on your body is not only fun for you, it is also a good exercise for your beardie. Just make sure, that you do not overdo it here. I know, I could also do that all day, but we really should give our dragons a rest from time to time, lol. If you live in a warm country you can also get outside with your bearded dragon when it rains and look how it reacts to rain. Have a look at the video below. The dragon in the video went for the balcony when it started to rain. It was not forced to do that. By the movements it makes you can clearly see, that it trys to swim a little bit. It is definitely having a good time and it is not distracted at all. Always make sure that your bearded dragon likes it. It could also be distracted by the rain and try to get away. Just keep an eye on your beardie and you will be fine. 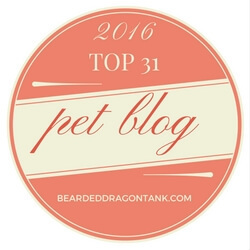 So that´s it guys, this is my top ten list of the best bearded dragon toys and actvities. What do you do with your bearded dragon? Do you take it outside or let it climb on your body? Did you actually try out something after reading this list? Let´s talk about it in the comments below! Just leave a comment and I will get back to you! Have fun with your bearded dragons!